Samhara: Thaji Dias of the Chitrasena Dance Company poses in perfection. Photo: Nan Melville. Samhara is a new dance work created by the Odissi dance ensemble, Nrityagram, together with their long-term friends and collaborators in Sri Lanka, the Chitrasena Dance Company. It was performed over the weekend at the Lionel Wendt Theatre in Colombo, fresh off the plane after a successful tour of United States and Mexico, having premiered in India. In New York it went on the boards at the legendary Joyce Theatre, with none other than Mikhail Baryishnikov in the audience. The show was choreographed by Nrityagram’s Artistic Director, Surupa Sen, with assistance from Heshma Wignaraja, the Artistic Director of the Chitrasena Dance Company (and eldest grand-daughter of Chitrasena, the founder of the Company). It is difficult to describe in any depth my feelings about the show, without giving some history and context. It is important to note the history of the Kandyan dance form, Chitrasena’s role in preserving it, and the journey the Chitrasena family and Company have travelled to get to where they are today, in order fully to consider the significance of Samhara to this Company and to Sri Lankan dance. It is also important that I disclose my personal attachment – both to dance and to the Chitrasena family and Company – before I proceed. As a baby, my mother handed me to Upeka (daughter of Chitrasena and the Company’s former Principal Dancer) to hold, and told her, ‘Now you have a dancer’. I became Vajira’s student at the age of 6, and went on to become Upeka’s student at the age of about 14. I danced in several productions produced by the Chitrasena-Vajira Dance Foundation, both as a child and teenager, in a time period spanning more than a decade. I became intimately attached to the family, and to the dance. At age 18, I decided to stop dancing. It had become something I couldn’t relate to anymore. I felt as though traditional dance – and perhaps the Chitrasena Company’s approach to it – no longer felt like it fully belonged in the modern world. Onto a little history about the Kandyan dance: in Sri Lanka, all traditional dance forms – the Kandyan, the Low-Country and the Sabaragamu – were originally used in the ritual-ground, to heal diseases, to quell droughts or as a supplication for prosperity, good harvests and good health. Typically, dancers were men. Women were deemed inferior, impure and unfit for this special honour. In the 1940s Chitrasena, a dancer, the son of an actor, faced with rapidly changing modern culture, decided that the only way to preserve traditional dance was to stage it as performance. Having studied the traditional dance forms rigorously, he became a dance teacher and choreographer, bringing traditional dance in Sri Lanka to the modern stage for the first time. In his hands, it was transformed: it was no longer outdated, it was animated, it was cutting-edge. Combining technical prowess with creative and conceptual agility and with modern-day production technique and technology, Chitrasena went on to create works that were revolutionary. His ultimate act of radicalization was to introduce his wife and protégé, Vajira, to the stage. When awe-struck audiences watched her don the ceremonial regalia worn exclusively by male dancers and prove her mastery of the Kandyan dance, a spell was cast. The female dancer had arrived. More than 50 years later, Chitrasena, the man who rescued traditional Sri Lankan dance, is survived by women: his wife, his daughters and his granddaughters. So too is the Kandyan dance – originally reserved for men – now invested in women. In this regard, Samhara is particularly special. This show is among many other things, an ode to the female dancer, the female body, the female form, the female herself: the Goddess, the mother, the source of all life. The choreography of Samhara knew exactly when to place the dancers in contrast to each other, and exactly when to have them move in unison. Photo: Nan Melville. Samhara bloomed into being in a space between the controlled gestures and upper-body undulation of the Odissi dance – the dance form that was derived from the seductively posed temple sculptures of ancient India – and the wilder, fiery, less controlled disposition of the Kandyan dance. It developed a series of exchanges between the complex and nimble rhythmic structure of the Odissi movement, the more sturdy and reliable rhythm patterns of the Kandyan drum, the delicate, subtle story-telling of the Odissi hands and eyes, and the decisive, large movement of the Kandyan dancers. These two forms, both ancient, both rigorous, were meeting face to face: they were showing off, contending with each other, rivaling and yet complementing each other and the stage before us was the site. The dancers melted from threes to twos to fours and fives in Sen’s flawless choreography – never predictable but always so fluid – and their bodies interacted on a bare stage lit by warm pinks and icy blues. The dancers were in a state of constant flirtation: with each other, but also with themselves, their own bodies. As the Odissi dancers undulate their torsos seductively and the Kandyan dancers look lovingly at their own arm-movements, it feels as though these women are marvelling at their own bodies, and each others’, in a state of wonderment and joyful surprise at seeing what the dance is doing to them. The pieces dissolve from one to another; the dancing never ends. The lights fade but the movement never stops. The audience holds its breath, captivated, as the slightest shifting of weight or the continuous, slow tilt of a head makes you believe the dancers are never still – even when you can’t see them. In one moment, one of Nrityagram’s Principal Dancers, Bijayini Satpathy joins Thaji Dias, Principal Dancer of the Chitrasena Dance Company, in a phrase of Kandyan dance – and she executes it playfully and flawlessly. In one other moment, Thaji joins her in turn, in a single Odissi move. Besides these moments – so brief and yet immediately poignant – the dancers are always in conversation, but never take on the others’ styles. Samhara never pretends that the different styles are somehow one. They are not, and that is the crux of the show. The world-renowned Odissi Dance Ensemble, Nrityagram. 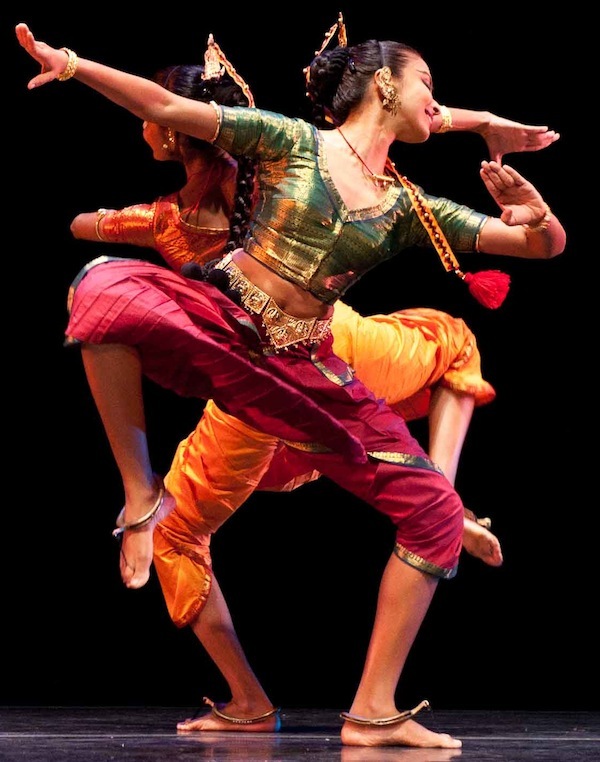 Odissi is an ancient form of Indian classical dance derived from temple sculptures. Photo: Nrityagram on Facebook. The Odissi dance form is sublime – its pin-point precision and its ability to combine every body part to create a perfect whole movement in an exact and definite moment, creates pure magic. It creates the kind of magic that only dance can really create. The presence of ‘Abhinaya’ (expression) within the form itself makes Odissi a form of story-telling, the dancers constantly emoting, constantly eloquent. The Kandyan dance form, on the other hand, is less precise and is less inherently complex. It is ‘pure’ dance; it is a blank slate on which you build movement to show-off technical skill. It has no story, it has no natural drama. The drama comes from the joy and the wild abandon of the movement itself. Samhara consciously or unconsciously showcased this explicit difference between the two forms. While the Odissi ebbed and flowed with beautiful ease, the Kandyan dance struck out with strength and impact. However, it was clear that the Kandyan dance didn’t have the same vital subtlety and nuance that the Odissi did. And this created an interesting conundrum: it was almost like the Kandyan dance had never been challenged quite this way this before. Yet the challenge was precisely the thing that made it come alive. In Samhara, the Kandyan dance looked better than it had looked in years. And so did the Chitrasena Dance Company. The Chitrasena Company has a long legacy of greatness, of inspired innovation within the traditional dance forms. At the height of its success in the 50s and the 60s, they were touring the world with Chitrasena’s masterpieces, pieces of dance theatre that were considered cutting-edge in the global dance arena. He recognized that technique was nothing without substance, nor substance without technique. And so what he did best was bringing the Kandyan dance to life – creating life on that blank, otherwise inexpressive slate. He gave it a soul – which it did not inherently possess. And soul is perhaps what newer work from the Chitrasena Company has been lacking. With the passing of the torch to Heshma Wignaraja, there is much hope that the work will finally begin, in this new era, to match or even surpass the greatness of earlier work. Heshma’s first true moment of genius as a choreographer came in the fund-raiser show produced in collaboration with Barefoot, Sri Lanka’s premier boutique handloom brand, Barefeet in Motion (2003). Subsequent shows, The Art of Chitrasena (2006) and Guru Pooja (2008), both conceptualized by Heshma, were celebrated new pieces of work. And while it was clear that the Company had grown in technique and style, and had clearly begun its journey to re-establishing itself as an important artistic force, neither of these shows seemed to match the intellectual rigor and depth of thought that made Chitrasena’s own work so unique. In 2010, Heshma choreographed Dancing for the Gods, and this was seen as a turning point. The choreography was beautifully structured, and it was conceptually brave – it was a reinterpretation of our most ancient ritual, the Kohomba Kankariya. The dancers were near-perfect. But just the previous year, Colombo audiences had had their first taste of Nrityagram. And so we couldn’t help but compare. And Dancing for the Gods felt incomplete: for dance that was meant to be ‘for the gods’, it lacked the sense of meditation, the deeply felt devotion and love expressed through every movement – every flick of the wrist or turn of the eye – of Nrityagram’s show. The stylish choreography of Dancing for the Gods felt somewhat flat and clinical. So what is the secret to Nrityagram’s success? It is the genuine undertaking of a philosophy that was also Chitrasena’s own: preservation through innovation. This manifests wholly and rigorously in the expert choreography and creative thought of Surupa Sen. Nrityagram shows are the ultimate testament to the role of classical dance in the modern world. In their hands, classical dance is not clunky, old-fashioned or boring. It is as cutting-edge, as moving, as the best contemporary dance work in the world today. Nrityagram reminds us that classical dance can be vital and relevant while remaining pure and untarnished. Therefore, in examining the Chitrasena Company’s work in contrast to that of Nrityagram’s, we are forced to ask a difficult question: is the Odissi dance form itself simply more interesting than the Kandyan dance form? Does it give a choreographer more meat, more substance to work with? It was at once puzzling and revelatory that the Chitrasena Company’s best work in recent years was in this collaboration. And it truly was their best. As I sat at Samhara, it was the first time since I had stopped dancing that I thought ‘I wish I was a part of this’. There it was: form and content, soul and technique, perfectly balanced, hand-in-hand. Let’s recognize Samhara as a true turning point for the Chitrasena Dance Company, and therefore dance in Sri Lanka. It represents a kind of brand-new return to form, a restoration and a revival of traditions and values close to Chitrasena’s heart. 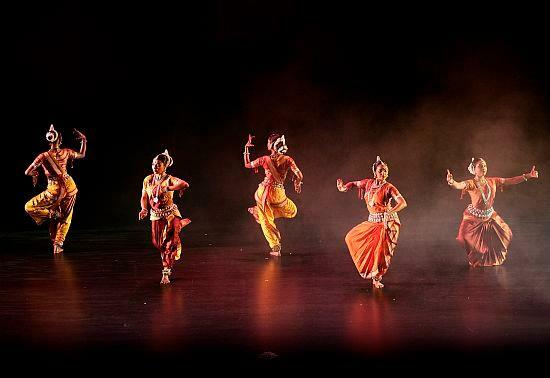 One is of taking Sri Lankan dance to the world, and Samhara has reinstated the Chitrasena Company’s place in the international dance world through its phenomenally successful tour. Another is presenting traditional dance as radical contemporary dance work, which Samhara has done successfully with Sen’s choreography and the immense skill of all five dancers. The last is the important tradition of artistic collaboration. Much of Chitrasena’s best work was created in close collaboration with musicians and artists who shared his values and artistic integrity. With Samhara, the Chitrasena Company returns to this idea, showing that perhaps their best work is created in partnership and friendship. It feels like the Chitrasena Dance Company has truly arrived in a new era of creative excellence and they have done it with a little help from their friends. It feels like the Company has finally come home: home to where they really belong, alongside others like themselves who will inspire and challenge them to new forms of greatness. Finally, it seems as though Samhara has delivered more than just the Chitrasena Dance Company home. The Kandyan dance itself, it seems, has been reborn, emerging reinvigorated to meet the demands of a contemporary world. And it is housed in the body of the female dancer.